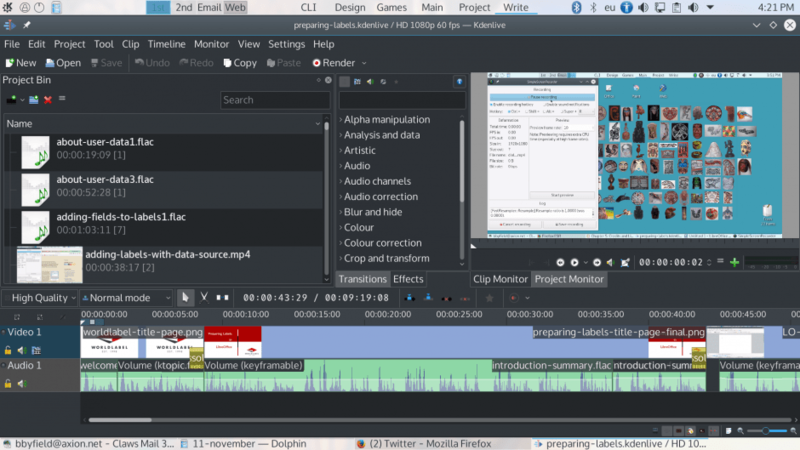 Kdenlive has become one of the main free software tools for audio-visual editing. Although complaints about earlier versions continue to dog its reputation — especially about syncing — the latest releases soon make clear that Kdenlive is now a mature and reliable tool. However, one thing it lacks is a general overview that helps new users navigate its complexity. Admittedly, the information users need is available. Yet finding it when you need it can be time-consuming, and add to the difficulties of learning a new application. Having just completed my first video — “Preparing Labels in LibreOffice” for WorldLabel — I think I have learned enough of the basics that my next effort should go far more efficiently. As a guide to myself, and to anyone else who might be starting to use Kdenlive, I present the following in the hopes of saving everyone some time and distraction. Kdenlive is complicated, but well-organized. 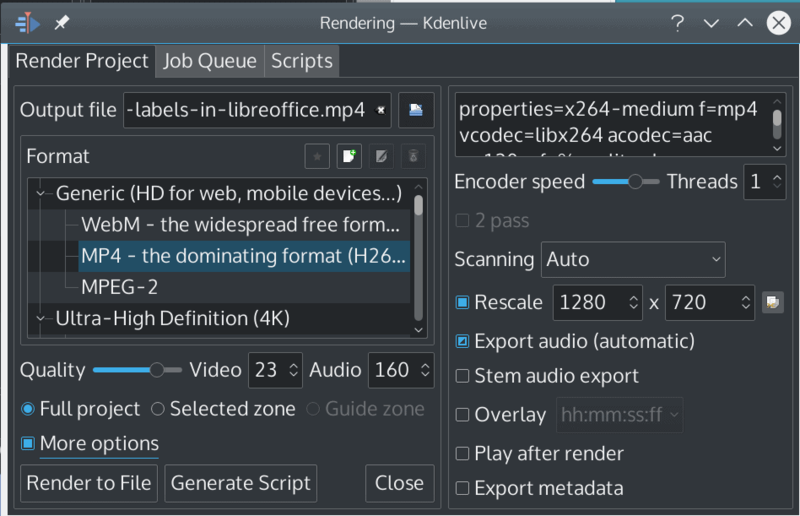 Kdenlive is an editor — not a generator of content. Depending on your project, you may need a microphone and a webcam, an audio editor like Audacity or KWave, and a desktop recorder like SimpleScreenRecorder or RecordMyDesktop. If you are using still photos, you may also need a screen capture application like Spectacle. Depending on your distribution, you might need to install video codecs to support the clips you are using. To begin production, organize your directory structure. If you have never worked on a large project, you might be tempted to skip this step — but, if you do, chances are you will regret being careless before you are halfway through production. Even a three minute video takes a surprisingly amount of resources, and you need to be able to find those resources quickly. 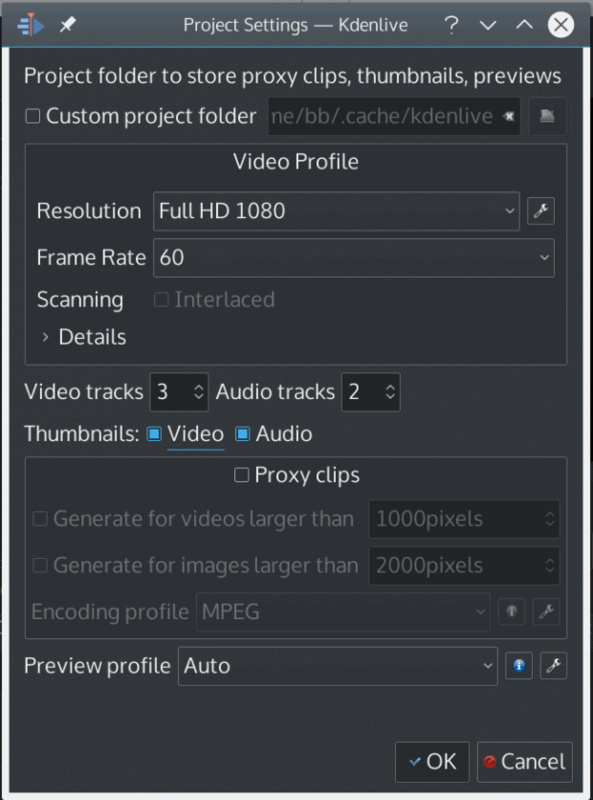 Moreover, although Kdenlive does display all the clips added to the project, an open file manager is often the quickest way to find the name of a clip that you want to re-use. The directory structure is simple. Create a top-level directory with the project’s name for story notes, planning, backups and the project itself. Next, I add three sub-directories for clips: audio, video, and stills. I use a fourth sub-directory for rendered files, so that I can find them quickly later on. As a final step, begin a script, outlining the various video shots and any narration. The script will probably evolve, but it can give you a sense of direction as you work. If you are narrating, the script can keep from wandering. For some podcasters, rambling is part of their style, but generally it is not nearly as endearing as many who are in love with their own voices seem to imagine. Even nothing more elaborate that an series of points to cover is an improvement. When you start Kdenlive, click the New icon to adjust the Project Settings. Mostly, you can ignore settings that you don’t understand, but if you want to keep your output files small, you should investigate the latest options. New users can accept the default settings, but you can lower settings to reduce the size of the finished video. Custom Project Folder: Change it to the top level directory you created. Tracks: While you are learning, 1 video and 1 or 2 audio tracks should be enough for you. Anything more will simply complicate things. And while multiple tracks can be a way of blending effects, such as narration and background music, most of your output will likely be heard online — hardly an ideal setting for audiophiles. Resolution: YouTube’s standard resolution is 1280×720, a 16:9 ratio that is a suitable all-purpose size. If you use a different size, keeping the same proportions will avoid any distortion or cropping, giving you one less concern. At first glance, Kdenlive’s screen looks complicated. And it is complicated — although better laid out than most rival video editors. However, part of the complication is to allow different ways of working. Once you find the way you prefer to work, you can mostly overlook large parts of the window. You might even decide to close some of the panes and access some features from the menu or context menu. The first part of the screen you need to be concerned with is the Project Bin in the upper left corner. The Project Bin is where you load audio and video clips and stills into the project for use. The Project Bin displays all the clips uploaded to the current project. You can add effects and edit a clip selected in the Project Bin using the In Point pane on the upper right. However, my personal preference is to prepare clips beforehand and edit them using the timeline below. The timeline is a drag and drop interface that displays all the project’s audio and video tracks, the clips on them, transitions, and effects. It is where most of the editing work takes place, which is why I favor it over the In Point pane. As with most video editors, Kdenlive’s timeline is where most of the work is done. You can play or stop playing what is on the timeline by pressing the Space bar. You can change the cursor’s present position on the timeline by clicking the Position bar above the tracks. To position precisely, use the Left and Right Arrow keys to move one frame at a time. 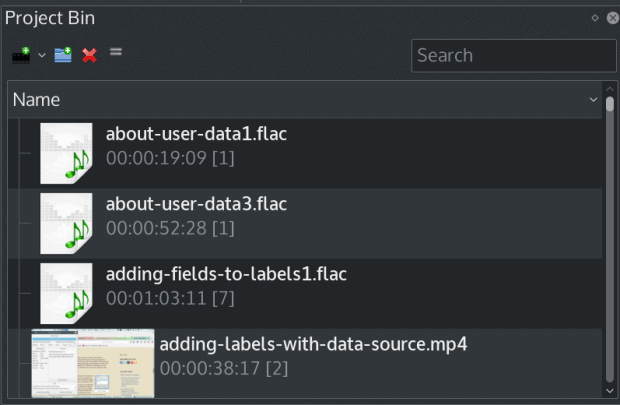 To add a clip, drag it from the Project Bin to the appropriate timeline track. When the cursor is at a position where the dragged clip will fit, it turns red. If the dragged clip does not turn red, you need to adjust the clips to its right to free up enough room. Another option is to cut part of the clip that appears on the timeline, which does not affect the clip itself. The simplest way to cut a clip is to drag the start or the end of the clip to shorten it. Should you want to cut a section from the middle of the clip, position the cursor and select Cut Clip from the right-click menu, parts of the original clip before and after it. Select the clip to cut, and press the delete key to remove it then repeat the action for the other end of the cut clip. The result is three clips: the clip to be cut, and the from the timeline. Edits on the timeline do not alter the clip, and have the advantage of being done in context. Much of the work in building a project is syncing the audio and video tracks. Stills can be useful as placeholders if more video is needed to sync with the audio, while gaps between audio clips can compensate when more sound is needed. Even more useful is the ability to cut clips. A rookie mistake — or, at least, my rookie mistake — is to try sync sections that are more than about thirty seconds long. The shorter the clips, the easier they usually are to sync. Once you are relatively sure of where all the clips should be, you can group them from the right-click menu to make any future edits easier. As a portion of the project is finalized, you may want to add transitions to a clip. Transitions are especially useful when you want to make large jumps in the video clips, such as changing from one window in an application to another without showing all the intervening steps. However, they are easy to overdo. Most of the time, you should choose a basic transition such as Dissolve, and no more than one or two different ones in the same project. Transitions are mostly for videos clips, although you may want to fade audio clips in and out. Effects should be used just as cautiously. However, if your video clips are from different sources, you may want to use the Color Correction effects to obtain a uniform look. You can use Audio Correction the same way. I particularly recommend using the Volume effect when doing your own recording, which allows you to correct volume by selecting key frames to regularize the sound of audio clips recorded under different conditions. As you work, you will no doubt find other effects that solve other problems. When audio and video tracks are synced, you have the video equivalent of source code. Like source code, for use it must be turned into executable form, a process known in video editing as rendering. To render a project, select Project | Render from the menu. Kdenlive can render a selected part of a project or all of it, and to a different resolution than the project itself — although you are still best off preserving the original proportions. Most of the time, the default MP4 should answer your needs, at least until you know enough to want something else. Rendering takes time. Without any major changes from the project file, you can expect roughly two minutes of rendering for every minute of video length on a reasonably recent system. Rendering can be demanding on hardware resources, so to avoid any errors, you should probably do nothing else while rendering and creep away to let the process continue uninterrupted. In case rendering leaves your system sluggish, you can set the rendering process to reboot your system when it completes. Rendering prepares the output file. It can sometimes be CPU intensive. There is more to Kdenlive than I have given here. All the processes I have mentioned offer a choice of options that can help you produce exactly what you require in what I find is a reasonably efficient way. However, with these basic steps, you can still produce high-quality video. Like with most creative projects, creating a video is more about being a perfectionist than the tools you use. Fortunately, Kdenlive’s basic functions are simple enough that they get out of your way, especially if you edit clips on the timeline. By editing on the timeline, you can make mistakes and easily undo them, which gives you plenty of room to experiment, especially once you have created your first project.